Wyndham National Harbor: Minutos D. C! National Harbor 2BR / 2BA - A poucos minutos de Washington, DC, ao longo das margens do Potomac, é um novo complexo cidade chamada National Harbor. Combinando todas as melhores idéias de maiores cidades da América, é uma área interessante, auto-contido com tudo que você poderia pedir em um destino de férias. Com Wyndham Vacation Resorts no National Harbor, você pode se instalar e desfrutar da vizinhança ou usar o resort como um trampolim para experimentar o melhor da nossa capital da nação. It was awesome experience. Beautiful property. Wish we stayed longer. Was an excellent experience and had a wonderful stay. Staff was very friendly and helpful and the room was amazing, above and beyond our expectations. Best hotel stay I've ever had. Staying at the Wyndham has been the best weekend experience I've had. I loved the size of the room, and the amenities. If I had to book now to guarantee the same room for 2020, I would 100% do that! Great place and very convenient to our convention. Great place to stay if traveling to the National Harbour. The best thing about the property were the people who worked there. Each of them was friendly, professional, and helpful. We received immediate responses to all of our concerns. At this location access to the area amenities was great, but access to DC not so great. We did not rent a car so we used public transportation. To get to DC, we had to go to Alexandria. For our purposes, it would have been more convenient to have stayed in Alexandria. However, we enjoyed the many shops and restaurants that were within walking distance. As to the resort, it did not have the usual amenities that we have experienced at other resorts such as organized activities, shuttle service (it would have been nice to have a service to the outlet mall and the MGM for free). It also didn't have a gift shop or any food available except for the vending machines. In our unit, it seemed like some of the furniture was missing. The second bedroom needed a chair and there was only one chair in the living room but space for two. The lighting in the second bedroom was horrible. The resort has a game room, but it didn't have much to offer. I would recommend this resort for someone who wants to be in National Harbor or who doesn't mind driving in DC traffic. I would not stay here again, because for me, Alexandria is better. A poucos minutos de Washington, D. C., ao longo das margens do Potomac, é um complexo urbano novo chamado National Harbor. Combinando todas as melhores idéias de maiores cidades da América, é uma área interessante, auto-contido com tudo que você poderia pedir em um destino de férias. 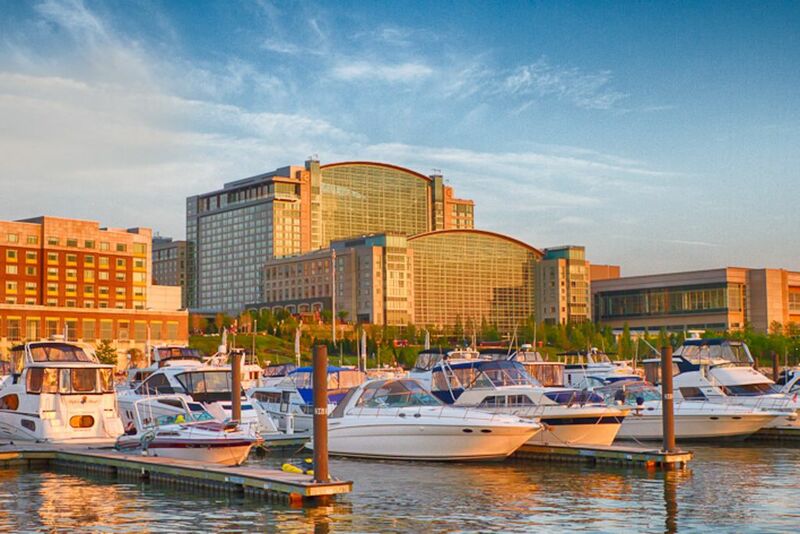 Com Wyndham Vacation Resorts at National Harbor, você pode descansar e aproveitar o bairro ou usar o resort como um trampolim para experimentar o melhor da capital da nossa nação. The calendar does help provide an instant and highly accurate price quote. However, because we represent many vacation property owners and resorts, the calendar feature isn't always 100% accurate. The live reservation system we use to check availability does change minute to minute. Please provide your phone number for a quicker response time. All reservations (3 - 7 nights) are subject to a $99 Guest Confirmation Fee. The fee is per unit, not per person. Reservations exceeding 7 nights will be subject to an additional Guest Confirmation Fee. Any changes or modifications made to the reservation after the reservation has been confirmed/finalized will incur an additional fee (changing reservation name, altering the length of stay, changing dates, unit size etc. will be subject to a $99 fee) There are NO Cleaning fees that apply. Daily housekeeping is NOT provided but may be requested for additional fees. Call us for specific quotes that may be different than the rates listed. You may also be able to take advantage of our Last Minute Specials based on availability! Specials must be booked over the phone at 888-832-4223. Changes to reservations once booked, including the addition/subtraction of nights, altering arrival dates or unit type, etc. must be done 20 days or more prior to arrival and are subject to availability and an additional $99 fee. Requests made 19 days or less to arrival cannot be honored. Travelers who cancel at least 60 days before check-in will get back 100% of the amount they've paid. If they cancel between 30 and 60 days before check-in, they'll get back 50%. Otherwise, they won't get a refund. Travelers must cancel by 11:59 am on the cut-off day before check-in to receive a refund. All times are specific to your property's time zone.